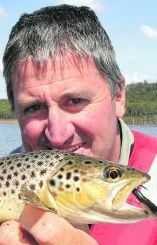 The opening of the 2011/ 2012 trout fishing season had many anglers excited, rainfall had consistently inundated the state for months prior, and our inland catchments realised levels not witnessed for many years. 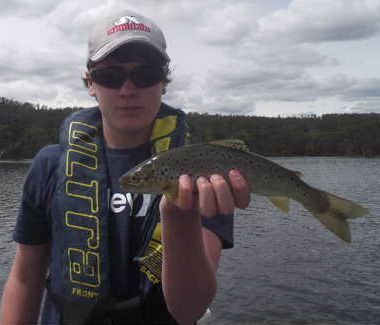 That being said, the overall condition of many fish landed in the central highlands disappointed anglers, Arthurs Lake and Great Lake being two of the biggest offenders when it came to not “reaching expectations”. One Central Plateau fishery that seems to have bucked the trend this season was Lake King William, where if anything, the average size and condition of its inhabitants has increased quite dramatically. Todd Lambert, John Cleary and Mike Stevens recently took a trip up there to see if the rumours were true. Dale Howard and I organised to head up to Lake King William yesterday. I dared not back out of this trip as I let him down at the last minute on his previous excursion to the Swan River. I also didn’t want the name “big girlie man” to gain momentum. We headed out to Lake King William 27 March, with Dale and Trev Howard, leaving home at 6.30am. On the way, and since we were going past it, we thought we would have a look at Laughing Jack Lagoon as we had never been there before. John Cleary, Mike Stevens and I headed out to Lake King William yesterday, doing "research" on this water for the next edition of Tas Fishing and Boating News. What an underutilised and hidden gem this place is. I cannot wait to head back there again. Although King William trout are small, many anglers find the high catch-rate to be very appealing. The lake is also one of the few trout waters open to year-round sport, though fishing in winter can hardly be recommended.